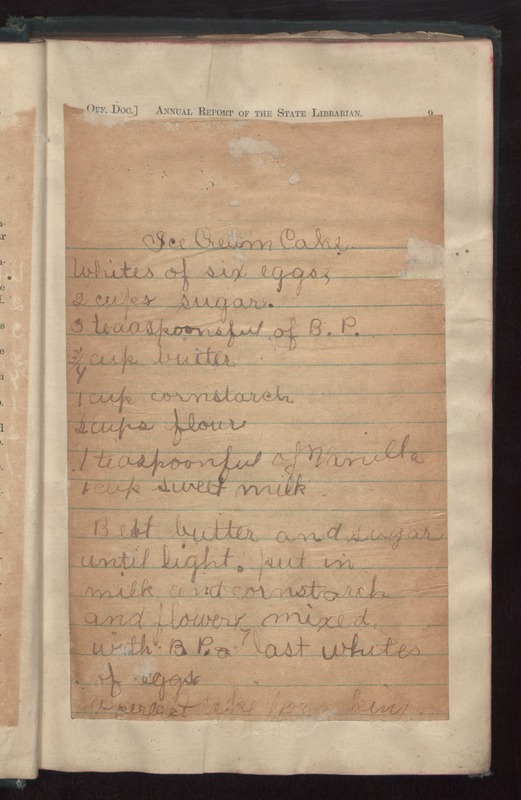 [This recipe pasted onto page 9 of "Annual Report of The State Librarian and was not transcribed.] Ice Cream Cake Whites of six eggs, 2 cups sugar. 3 teaspoonsful of B.P. 3/4 cup butter 1 cup cornstarch 2 cups flour 1 teaspoonful of vanilla 1 cup sweet milk Beat butter and sugar until light. put in milk and cornstarch and flower mixed with B.P. & last whites of eggs. A perfect cake for a king.